Tokyo-based Nippon Kaiji Kyokai, or ClassNK as it is more commonly known, is one of the world's leading classification societies with 9,104 ships representing 250 million gt under register, as of June 2018. 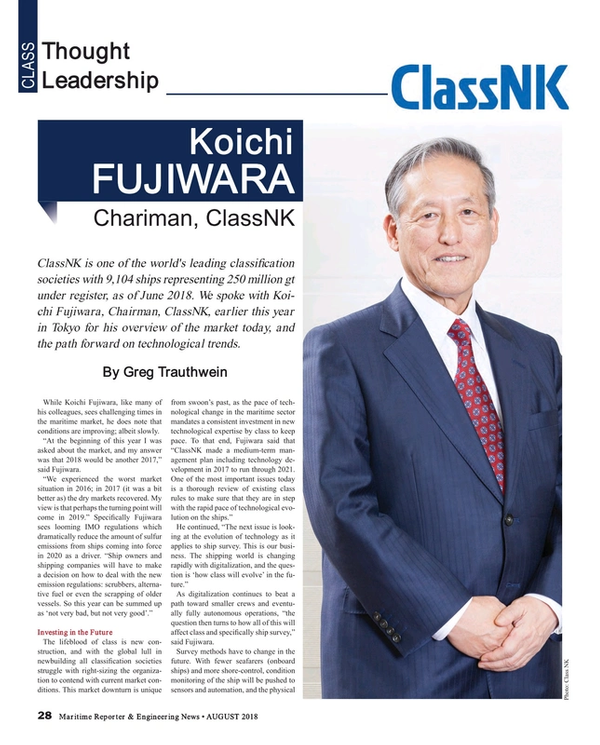 We spoke with Koichi Fujiwara, Chairman, ClassNK, earlier this year in Tokyo for his overview of the market today, and the path forward on technological trends. While Koichi Fujiwara, like many of his colleagues, sees challenging times in the maritime market, he does note that conditions are improving; albeit slowly. While the path is clear, the time-table to arrive is a bit fuzzy. “It is very easy to dream!,” said Fujiwara. “There are many ideas on how to use AI in classification and in shipping. It is important to keep in perspective though that only 30 years we could not imagine the iPhone of today; 30 years ago this was a dream.” For the shipping industry, the trick will be getting AI systems commonly accepted and in use across the industry, integrated and communicative with other ships. New Rules = New Ships? The maritime industry is in a transcendent period, with an avalanche of new emissions rules that promise to significantly alter the maritime landscape, and potentially trigger a spate of new construction as older ships prove too costly to convert. When asked his thoughts on the new rules triggering a new ship order spree, Fujiwara was succinct: “I hope so! As the CEO of ClassNK, I think I should be a little pessimistic about that. At the moment ClassNK is very stable, and we have the ability to invest in new technology. I see the market turning up in 2020-21, but I will take the pessimistic view in case not. He agrees that new rules surrounding Greenhouse Gas Emissions are the biggest change at the moment, particularly the recent decision taken by IMO MEPC to cut emissions 50% by 2050. “Using fossil fuels will only go so far in saving GHG, new concepts are necessary,” said Fujiwara. Through R&D ClassNK plans to maintain its leadership mantle in this regard, taking a deep dive into the digitalization and data and it is central to meeting ever more strict performance and environmental mandates.